This weapon is part of a group of late stage weapon developments coming out of the A.L.I.C.E Development Program. This weapon is designed for use in the Expanse. With advancements in technology and the sharing of data from Alien databases it has now been possible to create very large scale energy efficient offensive weapon systems for advanced settlements. 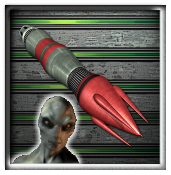 This weapon fits in the Settlement Defence section of your Expanse Settlement defences and due to breakthroughs in Alien advanced technology does not require staffing.